Do you frequently have to take your attention off the road to handle children in the backseat? Are you tired of hearing, ARE WE THERE YET? when on a roadtrip? Don’t you wish everyone could just happily entertain themselves? Then your need the Kids Travel Activity & Snack Tray! Our tray reduces your stress by providing a safe, stable surface for your child to eat and play on. Why Choose On The Go Families? EXTRA STURDY SURFACE. Guaranteed not to sag! 4 CONTINUOUS SIDE WALLS to keep food and toys contained. No more having everything on the tray slide into the child’s lap or the crevices of their carseat. SIDE WALLS THAT NEVER LAY DOWN ON THE JOB. Our reinforced side walls won’t flop over so you can be sure food and toys stay contained. SMOOTH EASY TO CLEAN SURFACE: Waterproof fabric make spills easily cleaned. The support foam and plastic tray can be quickly removed for machine washing. BUILT IN CUP HOLDER fits most cups and water bottles. Keep drinks close. Our tray GOES ANYWHERE your lap goes! Fits on most car seats, booster seats, in a stroller or wheelchair, on an airplane, bus or train, or a lap! Then remember we are an American family run company. On The Go Families offers a Lifetime Money Back Guarantee; from our family to yours. We will always be here to help you resolve any problem! 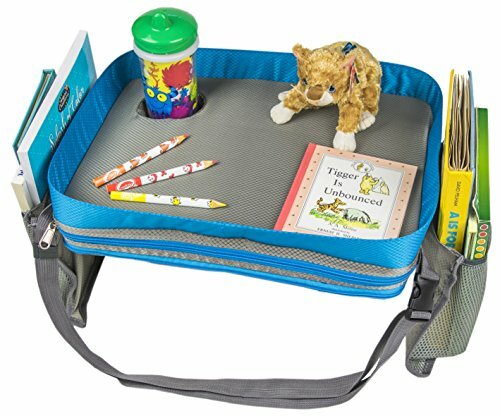 WHILE OTHER TRAVEL TRAYS are too flimsy, bend in the middle, or let toys and snacks end up in a child’s lap, our On The Go Families Travel Tray has heavy duty side walls, a solid inch of foam with a smooth table surface and 4 side walls to keep activities contained. This means a HAPPIER CHILD and a more PEACEFUL TRIP for you. NO MORE FUMBLING AROUND to get a snack to your hungry toddler in the backseat as you race down the interstate or finding crumbs in every nook and cranny of your car. Our tray will keep children’s food contained and within their reach so you can focus on driving. NO MORE BORED CHILDREN or miserable parents. Our trays are sturdy enough for coloring, building puzzles, playing card games and more. Our travel tray will restore peace and serenity to your travel, saving your sanity while keeping everyone calm, happy and self-sufficient. EASY TO CLEAN: our trays are waterproof and very easy to wipe up. They are even MACHINE WASHABLE for a germ-free clean. WE BELIEVE THE WORLD IS A BEAUTIFUL PLACE and you and your family deserve the chance to see and enjoy it. Traveling with children can be so rough some parents just opt to stay home. We believe that by making the journey easier more families will get out and explore in happiness. That is what On The Go Families is all about!